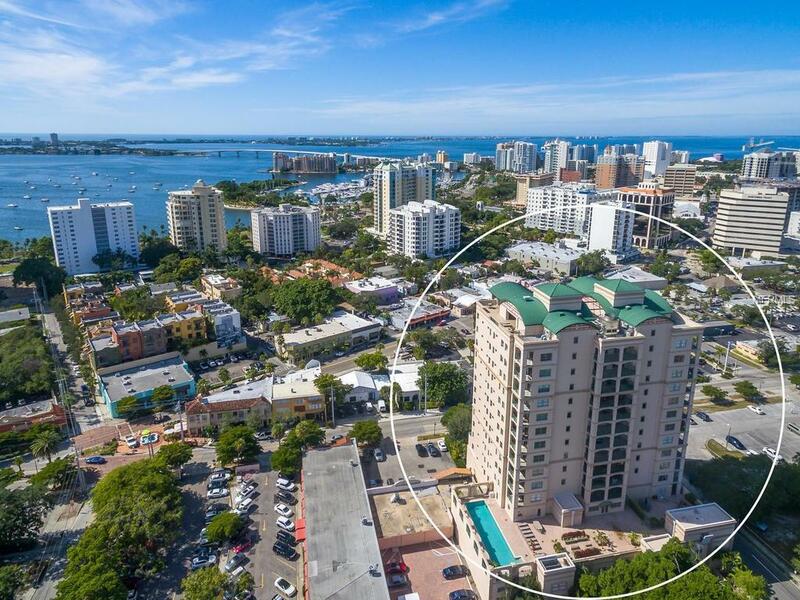 Loving where you live begins here, in the heart of downtown Sarasota. Kanaya, this luxury high rise condo with only 3 apartments per floor provides magnificent views in all directions including the Bay Front and City Skyline. This 7th floor apartment blends formal sophistication with a casual and comfortable way of life. Elements of design and decorating were carefully chosen to bring out the finest qualities. The moment you enter, from your private elevator, you will be captivated. Enhanced custom light fixtures, rich wallpapers, custom drapes and window coverings, 17" X 26" porcelain tile, Benjamin Moore paint palette, solid core doors, 6" baseboards to 9'4" ceilings are just a few of the many features. The flowing, open concept, floor plan, with over 3,000 sq. ft., provides ample room divided amongst three bedrooms and a study. Two covered lanais, one with western exposure taking advantage of sunsets over the bay front and the other extends off the guest suite. From the ground up, Kanaya, was built to promote health and harmony in every element of construction and design. The amenities include a 60' heated lap pool, fitness/gym room, pilates or yoga room, sauna, social room with kitchen, and a spectacular rooftop garden with 360 degree of water and city views. Kanaya is central to world-class restaurants, theatres and fabulous boutiques shops. Additional Lease Restrictions Lease Must Be Approved By The Board. See Condo Rules & Regulations. Pet Restrictions Pet Must Be Approved By The Board. See Condo Rules & Regulations.